Sandro Botticelli is one of my favorite artists and hisLa Primavera (also known as Allegory Of Spring) is absolutely stunning – especially viewing it’s beauty live at the Uffizi Gallery (La Galleria degli Uffizi) in Florence, Italy. 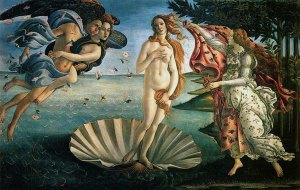 It is one of Sandro Botticelli’s most-loved paintings – along with the stunning Birth of Venus (La Nascita di Venere). Theory suggests that it was painted between 1477 and 1482 in honor of the marriage between Lorenzo di Pierfrancesco de Medici and Semiramis d’Appiano. The painting’s first home was the Palazzo Medici. But after the couple died, the painting was forgotten for centuries. Finally, in the mid-nineteenth century, the glorious La Primavera was moved to the Uffizi Gallery and has been admired by thousands of visitors since then. March 21, 2014 in Europe 2013.